Kill them all, let the Animus sort them out. Use your Eagle Vision. Only the real Jubair will be yellow. Complete the Investigations. The maps will eliminate all the decoys. Jubair is the easternmost target on your map. If you want to figure it out for yourself, do the Informer/Pickpocket Investigations and look at the attachments in your Memory Log before reading the rest of this walkthrough. I won't be able to keep the secret much longer. Judging from the videos on YouTube, most players don't like doing this much homework. Jubair is a runner, not a fighter. I have to recommend against Saving Citizens in the Middle District of Damascus unless you're working on your "Disciple of the Creed" achievement. Nothing ruins a running assassination faster than a bunch of Vigilantes grabbing your target and holding his arms back for you. Something you can practice before heading back to the Bureau is Free-stepping on the beams over the narrow alleyways, especially the ones around flag #23 on this map. At first you'll only have one target on your map. Jubair Al Hakim is in the Madrasah Al-Kallasah. When you get there, all the doors will be locked. 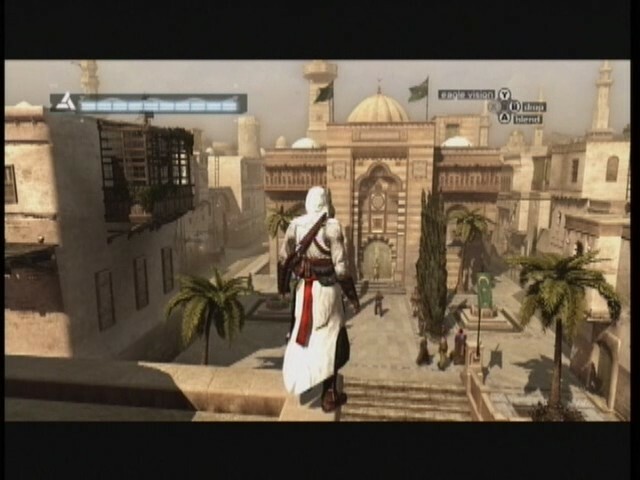 Altaïr's only entrance is on the roof of the Madrasah, where there are zero archers. 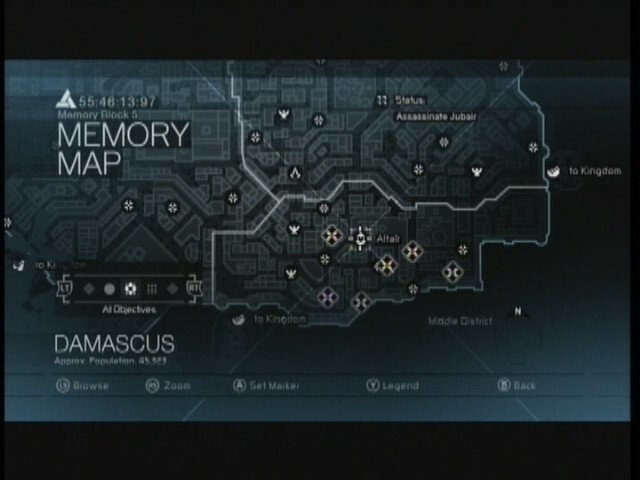 Once Altaïr's feet hit the roof it says "Ancestor's memory synchronized. Now recording". At that point you can no longer climb over anything, so find a staircase leading down from the roof and follow the path around to an interior balcony. After the bonfire cutscene, Jubair and his students immediately scatter to six locations around town. Now the south door of the Madrasah is open. You can either climb down and exit to street level or go back up for some roof hopping. Proceed towards the location of the real Jubair (as determined in INVESTIGATION). Jubair paces alone in a small garden with a sundial in the center (yes, it's really a sundial and it's in the shade :?). This is where his wife has hidden some books. She's got some 'splaining to do! A two man guard post blocks the door to the south. Some civilians gather outside the door while three archers patrol the surrounding rooftops. Within striking distance of Jubair, there are three places Altaïr can stand where the archers can see him but Jubair cannot. The first is the wooden walkway above Jubair on the east. The second is a smaller wooden platform hanging outside the southwest corner. You'd never guess the third: squatting atop the sundial. The standard thing to do is to slay the three archers (starting with the one on the highest roof) and drop down to the wooden walkway to the east. There's even a ladder showing you the way. From this position you can do a running air to assassinate or sneak down behind him for a low profile kill. Either way it's like shooting fish in a barrel. Ordinarily you'll want to avoid standing on the narrow west or south walls around the garden (or on the beam protruding over the door). 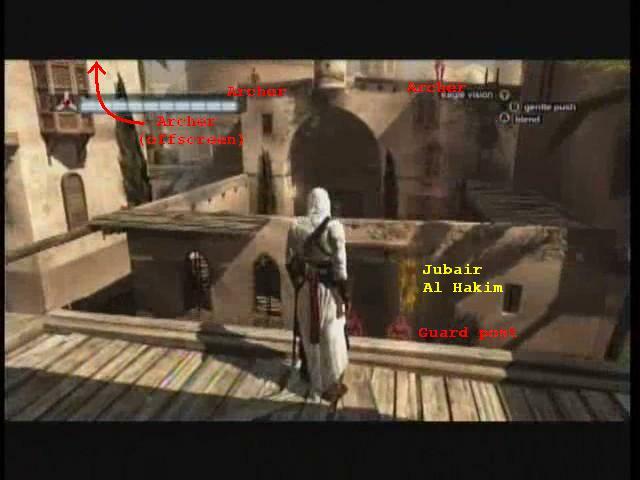 These are places where Altaïr will assume a crouching posture and Jubair will spot that right away. However, when you hear Jubair speaking you know that he's facing south. At this time it's safe to get on the west wall. Approach west from Trouble Maker Alley and either climb the wall from street level or Free-step to it over the heads of the Trouble Makers. Quickly target and air to assassinate Jubair. (Tip: Make sure the sundial isn't in your flight path.) The reason I mention this approach is that it can be done without clearing the area of archers. I have a better idea. Let's release Jubair Al Hakim into the wild and hunt him for sport! We'll even give him a head start. Do not pre-assassinate the archers - you're going to use them in a moment. Arm your Hidden Blade and stealthily make your way to the small wooden platform on the southwest corner of Jubair's courtyard. This is important: target him now by pulling the Left Trigger (L1 on PS3). Do not wait until he notices you. Now all you need is some way to spook Jubair into running. Should you crouch on a wall or lob a Throwing Knife? While you're standing there trying to make up your mind, an archer fires an arrow at you. That will work. The first place Jubair runs is through the door to the south. Then he turns right and heads west under those beams. Allow Jubair to turn you around. You've got him targeted so your view will always be facing him. Just stand there until you can see the first beam to the west. You can crane your neck a little further by holding the Right Thumbstick to the right. Now start Free-stepping across all the beams. Hold Right Trigger + A + Left Thumbstick (or R1 + X + Left Stick). (Tip: Push the Thumbstick towards the beams, not straight up, until you get fully turned to the west.) Stay to the right (north) side of the alley so Altaïr can swing from that second to the last beam overhead. After he lets go of that protruding beam, move your thumb from the A button to the X (PS3 users: from X to Square) while continuing to hold the Right Trigger. Altaïr steps on the last beam and dismounts like a gymnast except instead of sticking the landing, he jumps on Jubair and sticks him. Sweet! That's exactly how it works... in my dreams. The reality is that Jubair is a fast runner. 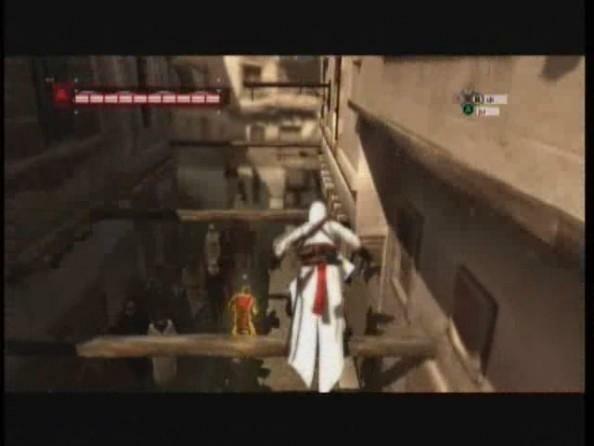 So fast that by the time Altaïr lands his death blow, Jubair has moved ahead to another location. Ubisoft dropped the ball on this one. They should have made it so Altaïr "puts a lead on him" or adjusts his trajectory in mid-air. What actually happens doesn't make any sense. Altaïr comes flying in as usual, Hidden Blade extended at the end of his straight left arm. You hear the "plunging steel" sound of an assassination while, a few meters ahead, Jubair freezes and arches his back as if experiencing a painful sense memory. When he freezes, that's your chance to finish him off. Continue holding the Right Trigger and hit X (or Square) again. If you're close enough you can do this with the Left Thumbstick released. This will result in a satisfying high profile assassination where you push Jubair down onto his knees first. Otherwise, continue to hold the Left Thumbstick (and Right Trigger) while you press the attack button. That always works. Altaïr's antics attract a crowd. Tackle your way through them to your right (north) and continue to hold the Right Trigger as you climb up the tall ladder behind the hay cart. You'll see a yellow Roof Garden ahead on the left. Quickly duck into it and Vanish before the large posse reassembles on the roof. Remember those decoys? One or two of them may run with Jubair momentarily and then veer off onto a different route. This is pretty clever. They act as body doubles to throw Altaïr off the chase. Hopefully you'll have the real Jubair targeted and won't fall for this ploy. The other thing to watch out for are the two man guard posts (shown as red barriers on the map). These are those guys who stand side by side with their swords drawn over their shoulders like baseball bats. Whenever you encounter a guard post there will be scenery steps (such as crates) to one side that you can climb and Free-step from without breaking stride. In fact, each presents another opportunity for a stylish assassination. Note that the middle route (if Jubair chooses it) has no guard posts at all.